The online application form has six pages: there are four pages of questions, a summary, and the final registration, where the form can be printed. Once you reach the final registration, your application is finished and only needs to be printed. If you are not sure whether your application has been registered or not, you can enter your temporary application ID in 'Complete Partially Filled Form' (see below). If your application is finished, the programme will show the SSDJ….. code generated for your application. With this code and your passport data you can print the finished application. You must paste a photograph and attach one (according to the requirements) on the form and sign in twice. Before starting with the application, make sure that your device has the software required for reading PDF files (eg. Adobe Reader). You will need it to save and print the finished form. You can print the registered application or complete a partially filled form here. (i) Select the correct country from the drop-down list: JUBA South Sudan. (ii) Select the mission: JUBA- South Sudan. (iv) Select your date of birth. (vii) Select the date you are planning to enter India. (viii) Select the visa type, for example TOURIST VISA. (ix) Enter the access code. Finally, click 'Continue'. Please note that the information entered on this page cannot be changed later. Check the information carefully! The visa type can be changed by the Embassy officials if required. (i) Surname and all given names (special characters such as ö, ü must be replaced by O, U etc., and hyphen must be replaced by a space, eg. Inga-Maria → Inga Maria). (ii) In 'Citizenship/National ID No. ', please write your nationality or your national ID number. ‘Visual Identification marks’ means marks such as scars or birthmarks. If you do not have any, write NONE. (iii) Choose your level of education (the closest equivalent). (iv) Nationality: if you have never had any other nationality, select 'By birth'. If you have previously held another nationality, select 'Naturalization' and then your former nationality from the next drop-down menu. (v) If you are not South Sudanese, the programme asks 'Have you lived for at least two years in the country where your are applying visa?'. This means South Sudan. Answer yes or no. Remember to provide proof of residence in South Sudan! (i) Fill in your passport details. (ii) The last question regards applicants with dual citizenship. If you have only one passport, change the default answer to 'NO'. If you have another passport, fill in its details. When you have replied to all questions, note down the Temporary Application ID given on the top of the page. If you have to exit temporarily, you can finish the application later by inserting this code in the programme. NB! This is not your proper application number! The proper application number is in the format SSDJ+8 digits. (i) Fill in the contact information of the applicant. We need either the phone number or the email address (preferably both) so that we can contact you in case of an emergency. (ii) Fill in the personal information of your parents (and spouse). Enter both given names and surname in the field. Enter parents' information even if they have already passed. 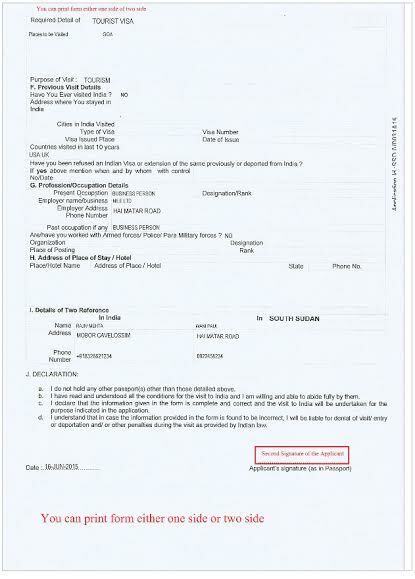 (a)Applicant’s marital status is either married or un-married. If you are divorced or widowed, please choose un-married. (b)The default answer for applicant's Pakistani background is 'YES'. If your family doesn't come from Pakistan, choose 'NO'. (iii) Enter your professional information. With underage children, the father's information is prompted. If you write mother's information instead, you can correct 'of Mother' on the printed form by hand. (iv) The question about military etc. history refers to paid employment. If you have performed a compulsory military service, please choose ‘yes'. (i) Fill in the information concerning the visa you are applying for. (a) Select the purpose of visit. For tourist visa, the purpose of visit must be 'Tourism'. (b) Port of Arrival in India means the city you arrive in, eg. Mumbai. Port of Exit is the city you leave from. (ii) If you have previously been granted an Indian visa, enter its details in the form. If you do not remember the visa details, enter 0000 as visa number and estimate the date of issue. (a) The default answer for previous visa refusal is 'YES'. If your visa application has never been refused, choose 'NO'. (iii) In ‘Countries visited in the last 10 years’ enter a maximum of 20 countries. (iv) SAARC countries are members of the South Asian Association for Regional Cooperation: Afghanistan, Bangladesh, Bhutan, India, Maldives, Nepal, Pakistan and Sri Lanka. (v) For reference name in India, enter the name and address of a friend in India or the hotel you will stay at. If you do not yet know where you will stay, write ‘ACCOMMODATION NOT YET BOOKED’ in both the name field and address field and '1234567' as the phone number. (vi) For reference name in South Sudan, enter a friend or a family member's name and contact information. If you live in South Sudan, enter an address in South Sudan. (vii) In ‘Photo Upload’ you may upload a photo. Please note that the requirements for scanned photo are the same as for the print photo. Currently a print photo is required even when a photo has been scanned. If you want to scan a photo, click ‘Upload Image’. Lastly, click ‘Save And Continue’. This page shows the information you have entered. Please check everything carefully, particularly passport details. If you want to make corrections, click ‘Modify/Edit’ at the bottom of the page. If everything is correct, click ‘Verified and Continue’. Another window will open, asking you to confirm that everything is correct. Click ‘OK’. The last page gives the applicant’s given names and the file number. Write this number down! It is required eg. in bank transfers and it will identify your application. Finally click ‘Print Form’. The completed application form will open on your screen as a PDF file. You can either print the form immediately or save it to print later. It's advisable to save a copy for yourself even if you print it immediately. The form should be printed before coming to the Embassy. It is not possible to print it at the Embassy. All Individual visa seekers are requested to apply for the Indian Visa through online application link or can apply by typing the URL:http://indianvisaonline.gov.in/visa/ in the address bar of web browser, in order to make an application for getting the Indian visa. 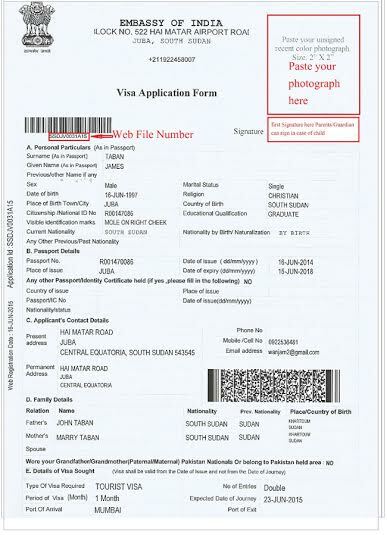 A print out of application form completed in all respect should be submitted at the Embassy of India, Juba, in person on the scheduled date along with the required documents as mentioned under the required document section of this Embassy website. 2. Online visa system does not accept application with any mistake (substantial or spelling). Please do not insist acceptance of such application. Therefore, kindly re-check and ensure that there is no mistake in online application form before approaching to the Embassy on scheduled date. Please also note that the Embassy will not be responsible for the rejection of the visa application due to any wrong information supplied by the applicant. 3. Furnish information exactly in the manner asked for in the forms. All entries must be same as your passport details. Applicants are required to verify the application details before submitting the online application. They have an option to save the online application form, in case it is not to be submitted. 4. Once the online application form is submitted by the applicant, further modifications are not allowed. Hence applicants are requested to check and validate the details before submitting the online application form. Applicants are requested to keep the File Number (generated automatically after the submission of online form) for further communications. 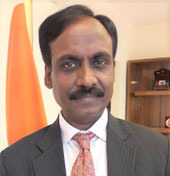 Foreign nationals should ensure that they are in possession of valid Indian Visa before they start their journey to India except nationals of Nepal and Bhutan, nationals of Maldives who do not require visa for entry into India for a period up to 90 days and those countries listed in visa on arrival. Tourist Visa on Arrival- Visa on Arrival Facility is available for holders of passport of following countries Australia, Brazil, Cambodia, Cook Islands, Djibouti, Fiji, Finland, Germany, Indonesia, Israel, Japan, Jordan, Kenya, Kiribati, Laos, Luxembourg, Marshall Islands, Mauritius, Mexico, Micronesia, Myanmar, Nauru, New Zealand, Niue Island, Norway, Oman, Palau, Palestine, Papua New Guinea, Philippines, Republic of Korea, Russia, Samoa, Singapore, Solomon Islands,Thailand, Tonga, Tuvalu, UAE, Ukraine, USA, Vanuatu, Vietnam. 2. Passport should have at least six months validity. Surrogacy: Any foreign national traveling to India for the purpose of surrogacy should travel only on medical visa, with appropriate endorsement. Immigration check is done for all passengers, Indians or foreigners, both at the time of arrival and departure. The passports are duly stamped at arrival as well as departure. Passengers should be careful to see that their passports are duly stamped before leaving the immigration counter. All passengers, Foreigners as well as Indians, coming to India or departing from India are required to fill-up D (Disembarkation) Card and E (Embarkation) Cards on arrival and departure respectively.